In a recent blog post we discussed the mini handbag trend. It’s literally everywhere and we are loving it. Sometimes you need a smaller bag that fits only your essentials such as a wallet, iPhone 6 Plus, and maybe a small makeup bag. There are some days when you don’t need to tote around your laptop and numerous things we transport back and forth to work on a near daily basis. It’s also a freeing feeling to downsize to a smaller handbag. And it’s even a better feeling when you are hands free and carry said bag cross body. When it comes to accessories, especially handbags, sometimes one needs to downsize by adding smaller bag silhouettes to the wardrobe. 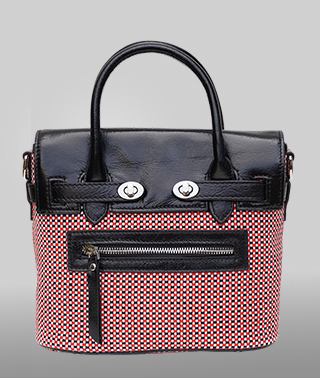 There is also a super new and even smaller trend: micro handbags. Generally, these are even much smaller than their mini sisters. Micro bags are super small, tiny renditions of larger designs. Although they are very cute, it’s hard to fit anything inside. Most of us now are glued to our smartphones and it’s nice to be able to store them in a handbag when not in use. We also have ID cards, keys, lipgloss, and other small necessities that we use on a daily basis, but forget about stashing those in a micro bag. As adorable as the micro bags are, they really aren’t very practical for a busy on-the-go fashionable. Although if you have a butler by your side to carry everything else for you, then you can probably get away with one of the new micro bags. They are also a great alternative to an evening bag when you don’t need to carry anything larger than a pack of gum. Micro bags are also cute as collectables. It wouldn’t be unheard of for a handbag-obsessed consumer to line her shelves with these colorful micro creations. Although collecting these tiny handbags would be incredibly expensive seeing how many are priced into the thousands. Our Pixie handbag is a smaller rendition of the original Reid satchel, but it’s not micro in size. At nine inches wide, it’s still small in scale that it looks absolutely adorable while being large enough to hold an iPhone 6 Plus, a paperback, makeup bag and more. It even has a pocket for an iPad mini. We knew if we designed it too small, it wouldn’t serve its best purpose which is to hold daily essentials without being a large handbag. It’s small enough to be considered a pixie, but not too small that it’s labelled micro. And though it’s smaller than the large satchel, it has a sharp, tomboyish edge which gives it a strong presence all on its own. We think it’s the perfect size for a daily outing that doesn’t include carrying a laptop or anything too big. As we stated previously, sometimes a mini handbag is exactly what one needs to round out a handbag collection. And the Pixie is just as lovely to carry by its handles or cross body. We put it to the test recently when we visited the flower market. It fit easily fit a water bottle inside and we wore it cross body as we wanted to be hands free. As we were on our feet all day, it was great not to be schlepping around a heavy handbag. Pixie was the perfect mini handbag to be by our side. In our design studio we are fortunate to work with several very talented illustrators and animators. They help bring many of our designer handbags to life. Even though spring is right around the corner, below is a 15-second animation we released on Instagram for our new Pixie handbag collection.